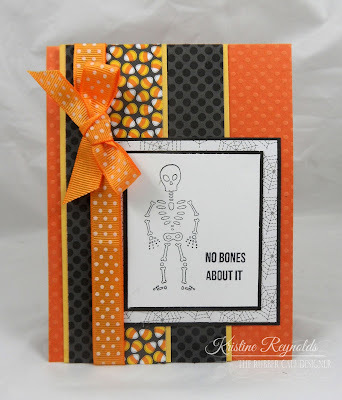 I am back with the second card that I created with the September Creative Cafe' Kit of the Month. 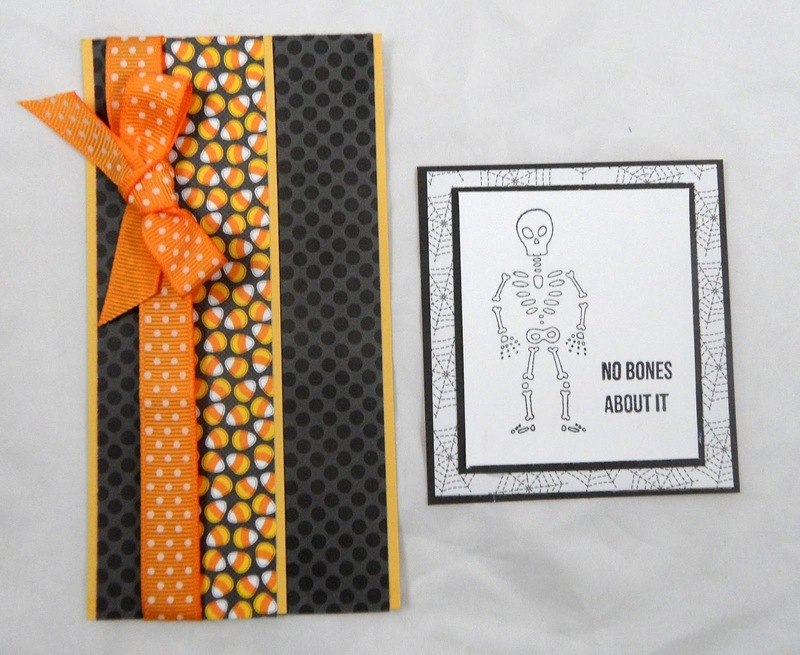 For the front of the card I created these two panels and then adhered them to an orange card base which was created by folding a 11" x 4 1/4" orange panel in half. 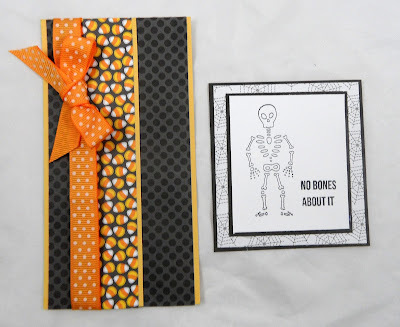 The bottom yellow panel is 5 1/2" x 3"
The black dotted panel is 5 1/2" x 2 7/8"
The next yellow panel is 5 1/2" x 2 3/8"
The candy corn panel is 5 1/2" x 2 1/4"
The skeleton is stamped on a 2 3/8" x 2 1/8" white panel. I backed it with a 2 1/2" 2 1/4" black panel. and then finally backed that with a 2 3/4" x 2 1/2" black panel. 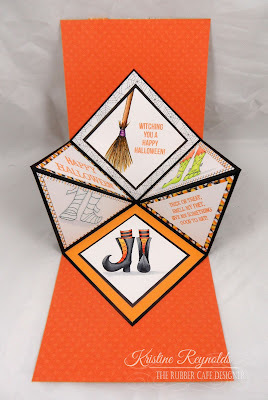 Open the card and you'll find a fun surprise! 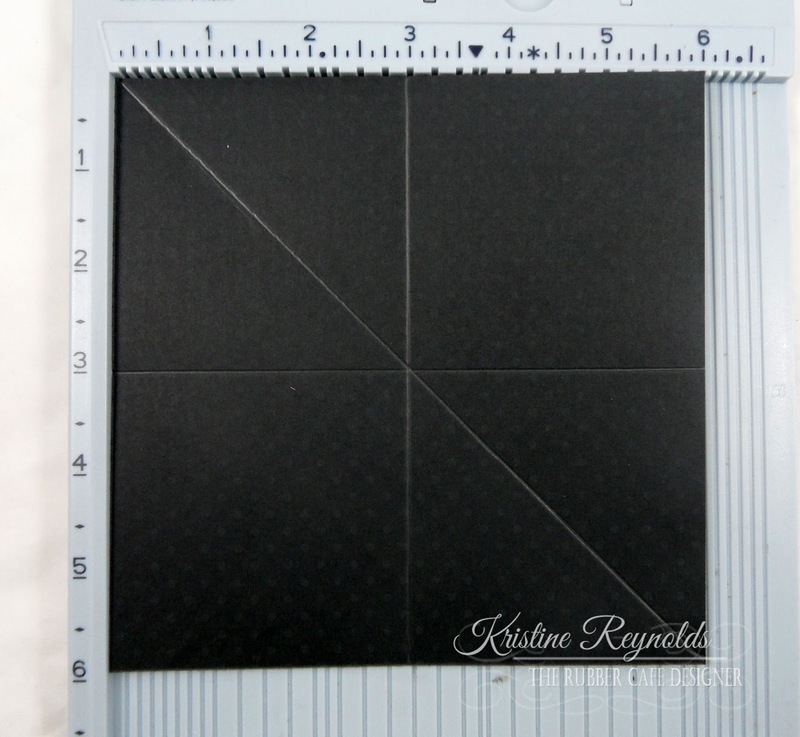 To create the inside panel, I cut a 6" x 6" panel of black cardstock. I used my Scor-Buddy to score and 3" vertically and 3 inches horizontally. Then I scored the panel from corner to corner. 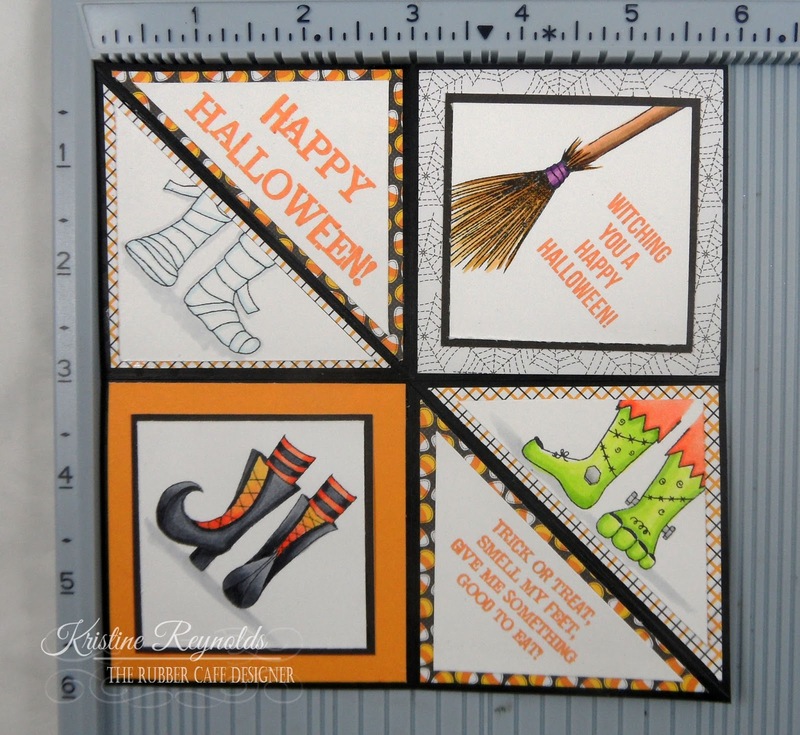 I chose paper from the Doodlebug paper pack that comes in the kit and adhered it to the panel as shown with . The square panels are 2 7/8" square. 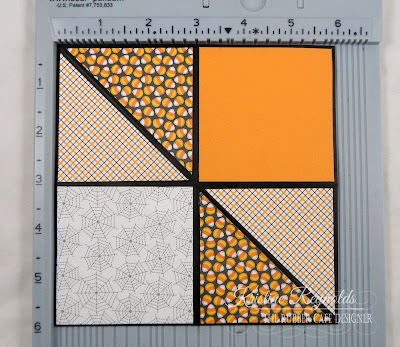 To create the triangles I cut panels 2 7/8" square and then cut diagonally to create the triangle panel. I created the image and sentiment panels and then adhered them to the panel with Scrap Happy Glue. 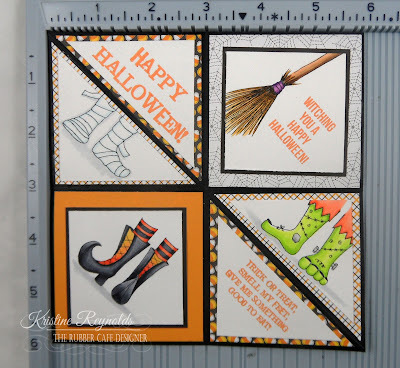 The broom and witches boots are on white panels that are 2 1/2" squares. I adhered the stamped panels to a black panel and trimmed close to the edges. 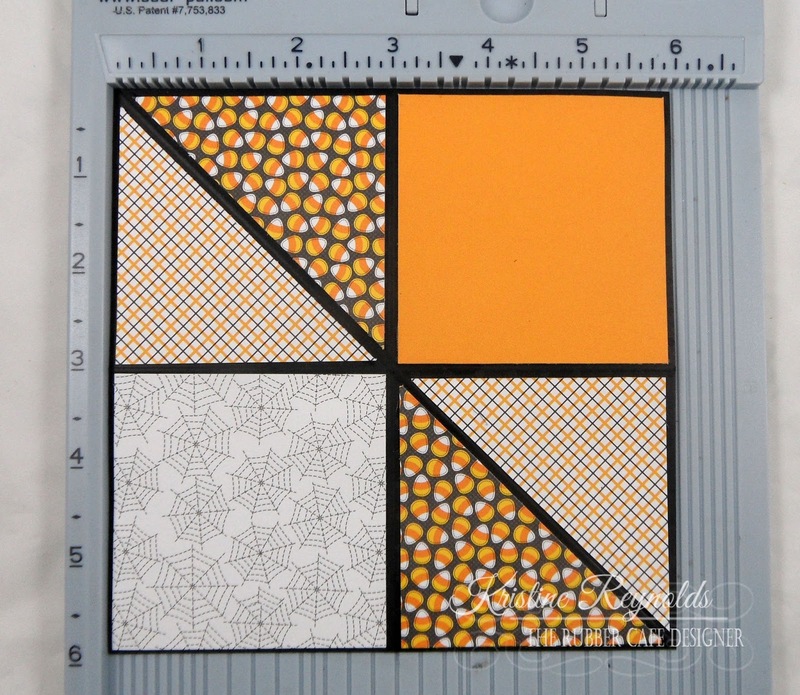 The white triangle panels were 2 3/4" squares cut diagonally to create triangles. Fold on the score lines so that it looks like the picture below. It reminds me of the cootie catchers I used to play with as a kid! 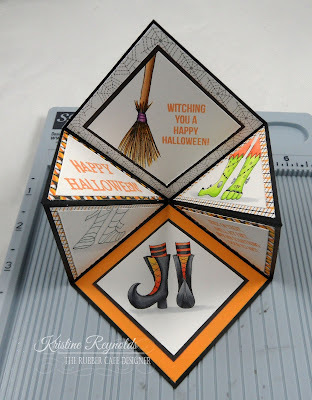 To adhere to the inside of the card apply Scrap Happy Glue on the bottom of the witch shoes panel. 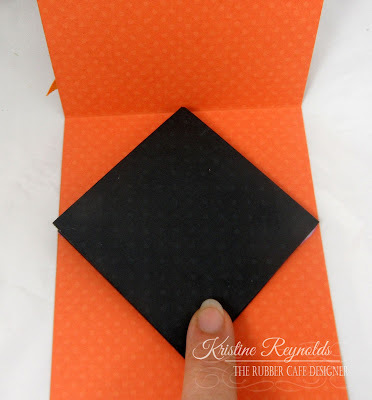 Press on to the inside of the card with the top point at the fold mark. Then apply Scrap Happy Glue to the part of the black panel showing in the picture and then close the card. I placed something heavy on top of the card and let it dry for at least 30 minutes. 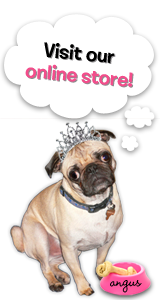 When you open it, you'll have this fun surprise! 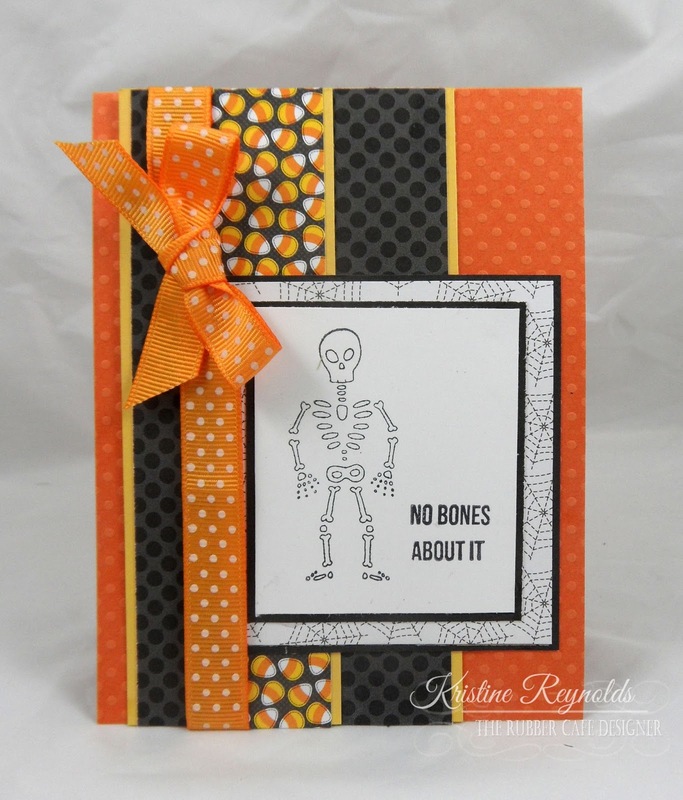 Beautiful card. I was surprised with the opening of the card. Thank you for the instructions. Great job.